I just dropped my boys off at Camp Corral for their 2nd and 4th years. I wanted to tell you thank you for what you do, and the donations you provide. My oldest son told me his favorite part of camp is when he gets to pick out his blanket—he always chooses a quilt! The quilts we have play a very important role in our family. They are our beach and sports games necessity. The kindness stays with us throughout the year with having it there to sit on and snuggle with. My children’s father did two combat deployments to Iraq with the Marine Corps. He was medically retired for PTSD a few years ago. What’s really important about the blankets Is that sometimes at baseball games we sit on the quilt and see the tag that reads “Project Linus”. It is important to us because we know that there are people who take time to want to make a difference in someone else’s life. I humbly send your local chapter a huge thank you. Please share my gratitude with your team of volunteers. You all deserve to know how much Project Linus means to my family. 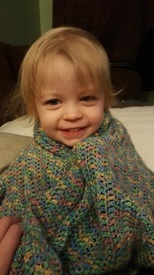 Emerson and her bestest blanket - Thanks to people like you! --I am so glad to be a part of Emerson's happy life. ​The work you do is so appreciated! 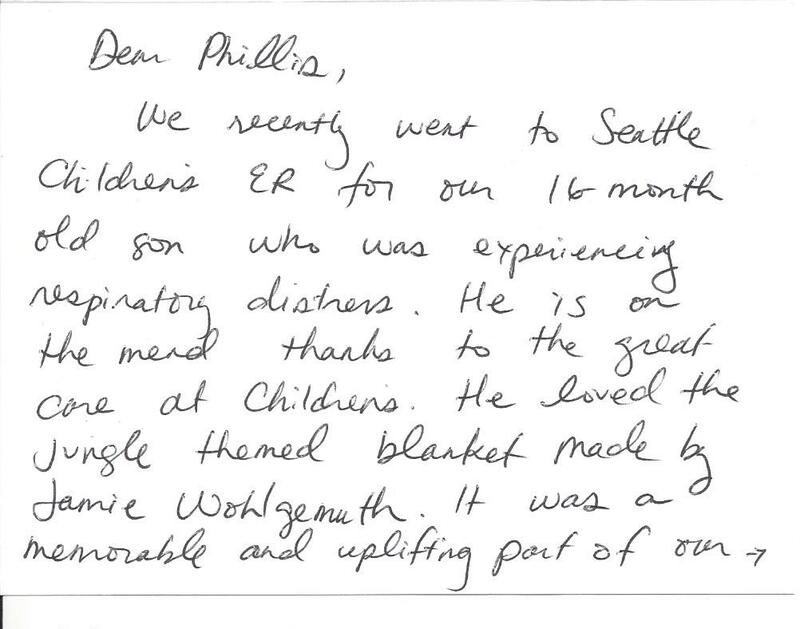 ​This is a letter with a request that came in and Jamie found the required fabric and made 2 blankets for this little boy. 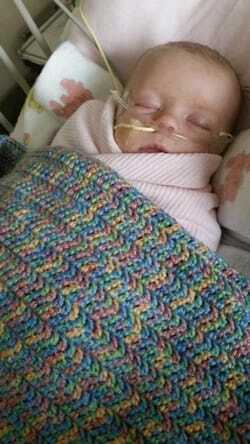 "My son was just at children's hospital in Seattle he is a preemie and has been real sick they had one of your wonderful blankets in his room it meant a lot to have something so beautiful in his room for him he loves the show Daniel tiger and I was wondering if you could make him a Daniel tiger blanket. 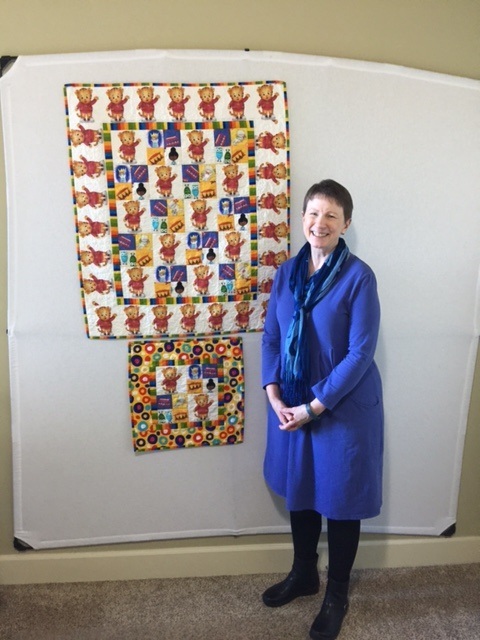 Thanks again for making my son trip to children's feel like home "
at the Pacific Fabric store in Bremerton where they donated to us some flannel material that they had to much of... 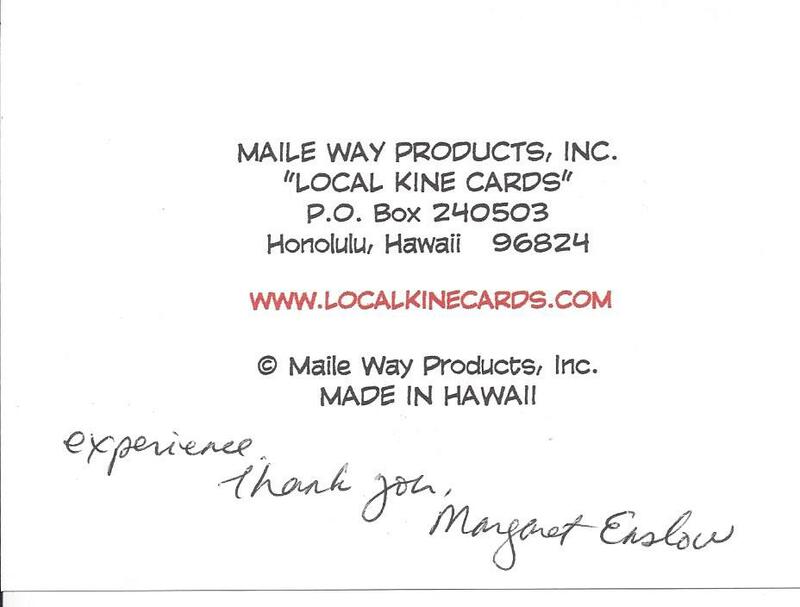 It was quickly distributed ....Thank you Claudia for sharing with us. ​Mary Jane has donated lots of fleece and material again this year and it will be available to grabs at the Appreciation Tea June 3rd... be sure to come and add to your stash. Wanda donated lots of beautiful fabric for quilt making and some of it is already cut into bits and bobs for making scrappy quilts. Some juvenile prints and lots for the older kids.